Despatch manufactures high performance ovens and furnaces that deliver tight temperature and airflow uniformity for consistent, reliable results for simple to complex, high-volume applications. With over 100 years of experience, Despatch has provided equipment for nearly every thermal processing application, and has the technical capability to modify existing designs to meet next generation requirements. 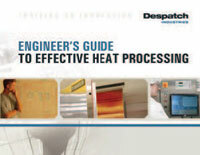 Despatch offers the unique capability of integrating precise thermal processing with ancillary technologies to create solutions for even the most complex systems. The company’s team of highly skilled engineers designs, installs and optimizes all equipment and controls for maximum performance. Electric, gas and infrared equipment may be designed for batch loading, or for a continuous flow of work using a conveyor. Heat can be transferred to the work by natural convection, forced convection or by radiant heat sources. In addition to different types of transfer, heating equipment may be designed to contain special atmospheres such as argon or nitrogen, or may incorporate special construction materials necessary for a specific application. Despatch has a reputation for superior temperature uniformity which is critical to consistent product quality. Uniformity is achieved by minimizing heat loss through the oven walls, strategically locating fresh air and exhaust openings to provide a positive pressure differential, and the oven airstream is designed so air passing through the heating elements is adequately mixed before entering the work chamber. The most important factors determining temperature uniformity are the type of airflow and the volume of air being moved. The best uniformities are maintained when airflow is uniform and reaches all points in the oven. As temperatures increase, higher volume airflow fans and motors are used, insulation is increased and more stringent airflow distribution is used. 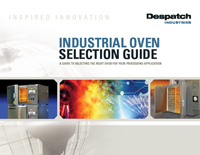 Despatch tests ovens and furnaces for uniformity with the use of a nine-point thermocouple survey. A thermocouple is placed in each corner of an empty oven, at least 3 inches from any surface, with one thermocouple in the center. When selecting an airflow pattern, the most important consideration is the load configuration. The main goal is to minimize obstructions to the airflow for more uniform heat distribution and to maximize the product surface area with which airflow will come into contact.